This is a sponsored conversation written by me on behalf of SeaPak. All opinions & text expressed below are 100% my own. Cook the SeaPak Clam Strips according to the package directions. Cook your bacon to your preference, allow to cool, and then roughly chop. Set both aside once cooked. Using a rolling pin or your hands stretch the pizza dough out into a 10-12 inch circle on a lightly floured surface. Don't stretch it too thin! You need the dough to be thick enough to sit on top of a grill grate without falling through. In a small saucepan, heat the butter over medium heat. Once melted, add in the flour & cook for 30-45 seconds. Slowly whisk in the half & half. Then stir in the salt & pepper, garlic, & mozzarella cheese. Heat another 2-3 minutes until the cheese has melted and the sauce has thickened slightly. Heat your grill over medium-high heat. Once heated, place the prepared pizza dough on the grill. 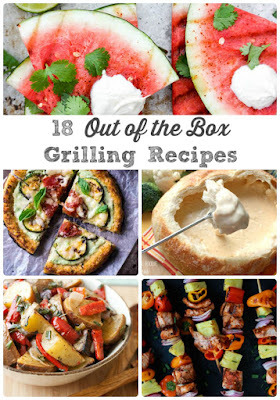 (Feel free to use a piece of aluminum foil coated with olive oil over the grill grate.) Cook for 2-3 minutes on one side, then flip over. Once the dough has been flipped, quickly spread the white pizza sauce over the cooked dough side. 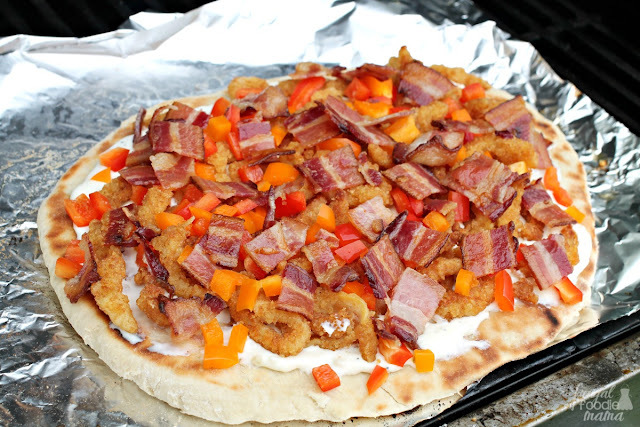 Then top with the clam strips, chopped bacon, and diced bell peppers. Cook on the grill with the lid on for an additional 3-5 minutes. 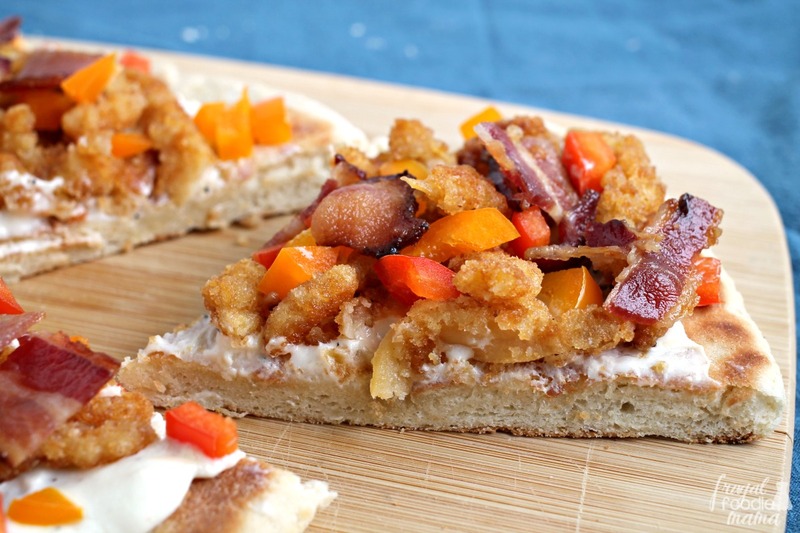 Be sure to check it every minute or so to make sure the bottom crust doesn't get scorched! Remove from the grill and allow to rest for 5 minutes. Slice and serve. Did you all know that the USDA recommends that you and each member of your family eat at least two 4-ounce servings of seafood each week? 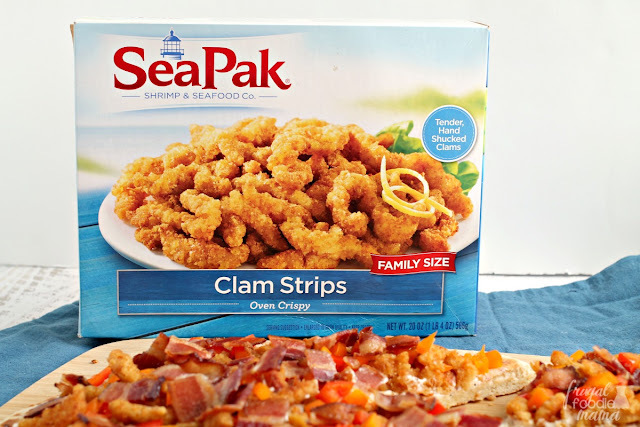 With SeaPak, it is easy to add seafood to all of your family's favorite summertime recipes with their super convenient & quick seafood products. Don't roll out the pizza dough too thin! I would suggest about a 1/2 inch or so thickness. You want the dough sturdy enough to not fall through the grill grates, but not so thick that the inside of the pizza dough doesn't get cooked all the way through. You need the grill to be hot from the second you throw the pizza dough on it. Make sure the grill temperature is at least 550-600 degrees before placing the dough on. 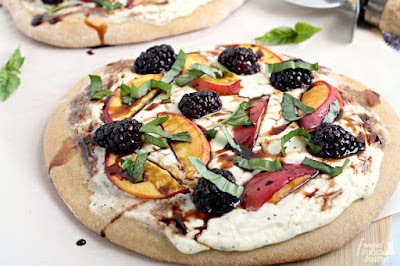 Have your toppings ready to go before placing the dough on the grill! Once you flip the pizza crust, you will want to get the toppings on asap as the pizza will cook through very quickly at that point. I placed the chopped peppers & bacon, the baked clam strips, and the already prepared sauce on a large tray that I carried out to the grill when I initially placed the dough on the grill. If you are afraid that your pizza dough will slip through the grates (like I was), feel free to lay down a large piece of aluminum foil brushed lightly with olive oil over the grates after you have heated the grill. 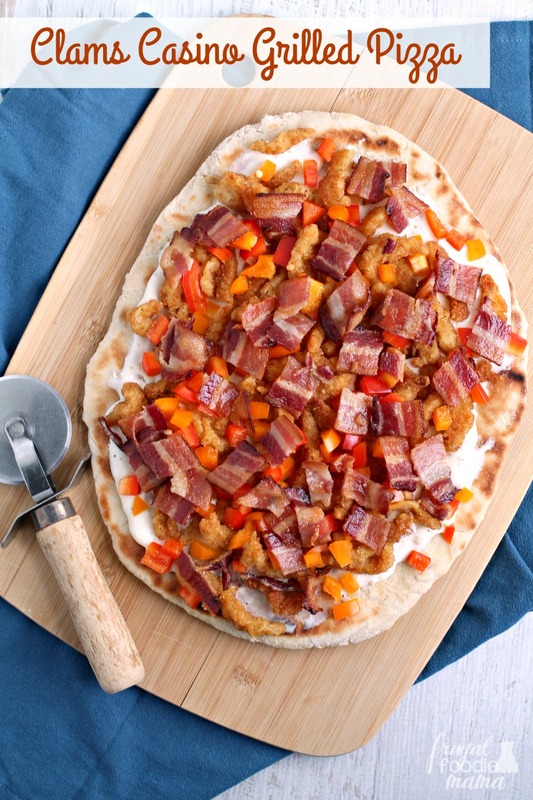 It worked perfectly, and the pizza still had that great grilled flavor & texture. How will you use SeaPak seafood in your family's favorite summertime recipes? 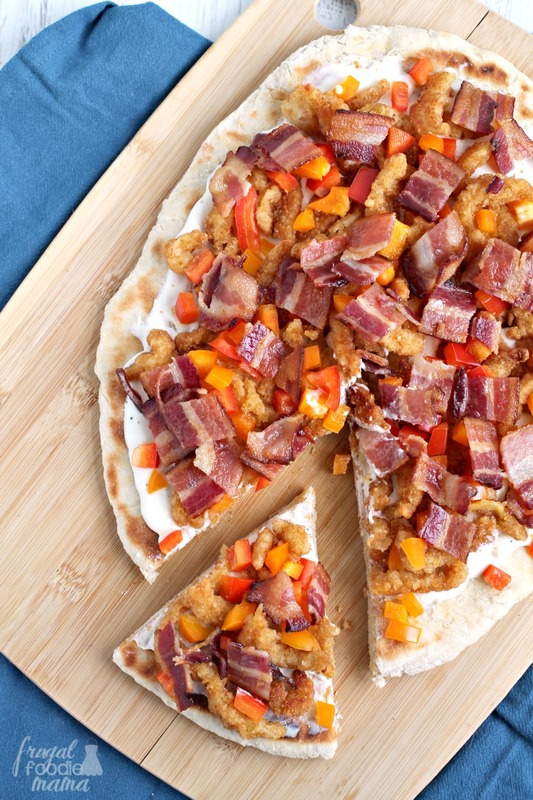 What are your best tips for grilling pizza? 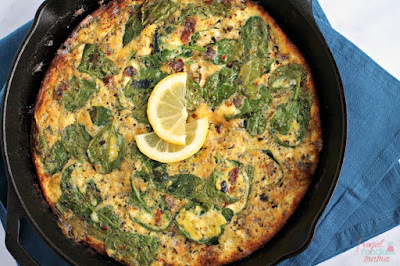 Looking for even more coastal summer recipe inspiration? Then be sure to follow SeaPak on Facebook, Pinterest, & Instagram! To find which SeaPak products are available near you, just click on over to the product locator on the SeaPak website.